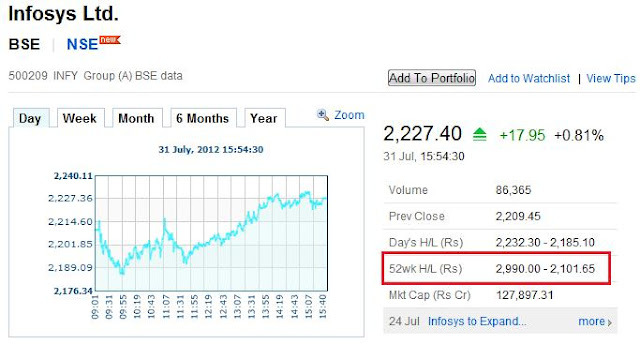 If you're investing in shares, you might have seen portals which tell you 52 week high and low values of that share. Comparing current value of the share with the 52 week high or low will give a reasonable indication as to how much the value of the share might swing on both sides. For example, refer image below. In past one year, Infosys shares have been fluctuating between 2101 Rs and 2990 Rs. So I know that current price of 2227 is on the lower side. What I'm looking for, is something similar for travel deals. I know the lowest price benchmark and I want an alert if there’re some deals below this bench mark. Not otherwise. Example: In Feb 2011, I’d flown Chennai-Colombo for Rs 4008 INR all inclusive. Subsequently the lowest price I saw on Spicejet website was some Rs 2900+ at one point of time. At present Air fare to Colombo start from 6k onwards. If I see any airline offering a return ticket under 4K, I’m ready to plan an instant weekend trip to Colombo. But I don’t want to be manually scanning travel portals and deals regularly. Why can’t some portal take my preferences and alert me if there’re deals cheaper than the upper limit I’ve set? Similarly, Chennai-Kuala Lumpur Air Asia deal was 7k all inclusive last year. I’d seen an Emirates package deal to Dubai from 25999 onwards, including hotel, flight and few other inclusions. If I get a better deal than these, I might decide to buy one right away. But I’ve not seen any mechanism which can auto alert me. Technically it is not impossible to support such a feature (if price for A to B is less than Rs X, email user Y). but such features are not supported intentionally, as it defeats the very purpose of having such offers. When airlines (or other service providers) offer very low fares, it is done with a purpose. They intend to get new customers, penetrate new markets. When a low fare is announced, only few seats are offered at that lowest price. The idea is to advertise low fares, make people come to the website, search for the price. After first few seats are sold at lowest price, second slab kicks in, which will be priced a bit higher. Many who come to website are likely to book even in the second and third slab. If alerts are facilitated, low fare seats will be booked in no time and the real target audience will never get to fly. Do you agree with above view? Do we have any travel portal/app which takes our preferences and bid prices and alert us if there's a deal cheaper than that? All of us would like an app that can book Tatkal ticket as soon as counter opens, but IRCTC or Railways is unlikely to allow such apps as it allows only some people to gain unfair advantage. Update: Cleartrip has a Fare Alert tool and a chart mechanism. But it doesn't serve my purpose. Nice post. There should be an independent applet which does provide information about lowest rates. Technically, benchmarking low rates will be the only challenge. Cleartrip does offer something like this for domestic flights but I have no idea how they implement it. Idea sounds interesting. But, if I think from a flight company's perspective, what do they stand to gain from such a feature for the customer. Anyways, like you said, low costs are invariably viral and as soon as those initial seats get filled, the cost goes up. If such a feature is given, airlines would have higher occupancy, but lower margins. Again, as an airline, it doesnt server the purpose. Try install add on called as "buyhatke" for comparing prices on firefox browser. Iam not sure whether it would suggest you for travel charges. It works fine on Ecommerce websites.